"This is such a great, simple red meat-lover's dish. The sauce is flavorful and easy to make. This dish looks like a lot of work, but is so simple. Great for impressing people." Prepare gravy mix in a small saucepan according to package directions. Stir in cream, vinegar, white wine, and peppercorns. Simmer over low heat for a few minutes just to blend the flavors. Meanwhile, heat a large skillet over medium-high heat. Season steaks with salt and pepper (if desired) and place in the hot skillet. Fry for 7 to 10 minutes per side, or to your desired degree of doneness. The internal temperature of the steaks should be at least 145 degrees F (63 degrees C) for rare meat. Remove steaks to a serving platter or individual plates, and drizzle each one with the gravy. Garnish with peppercorns and fresh parsley for special occasions. Not really what I expected....the peppercorns didn't give the gravy much flavor. If I made again I would omit peppercorns and vinegar and maybe add some mushrooms. This recipe is an A+! I just made it. Didn't have cream so added sour cream and decided to throw in some mushrooms. Oh and I broiled the steaks. Fantastic!!! Awesome recipe thanks. Excellent recipe! My husband loved it. 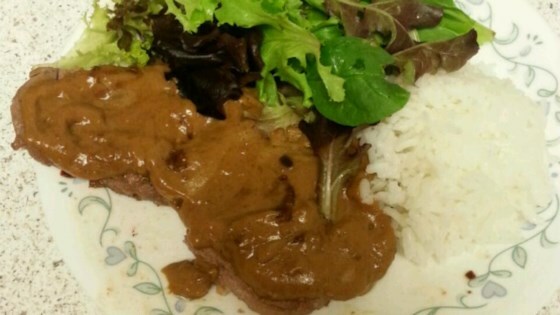 This gravy was sooooo easy to make and it can be used with many other meat dishes as well. What a nice combination of ingredients. I followed the recipe exactly it was easy and very tasty. I even used a light cream. Simple and good you can't beat that! Thanks for the recipe.